Phall Photo Friday is a weekly feature here. Phall= P(atti) Hall. Categories: Phall Photos | Tags: flowers, garden, photographs | Permalink. Categories: BLOG TALK, Phall Photos, Writing Journal | Tags: garden, hiatus, photos, pond, sunrise | Permalink. Glass wall in new secret garden. I could have waited for tomorrow and placed this glass wall photo in “W” for Wall, but I can be a bit impatient at times…that last part would fit in “U” for understatement! The camera continues to be an issue. I’m learning to use the camera on my phone, until I can find a teeny tiny screwdriver to repair my camera—no, the ones made for eyeglass repairs are too big. My neighbor even made me one, but it only lasted for 4 screws. My secret garden is coming along. Neighbor/friend, Greg, brought more beach stones in today. 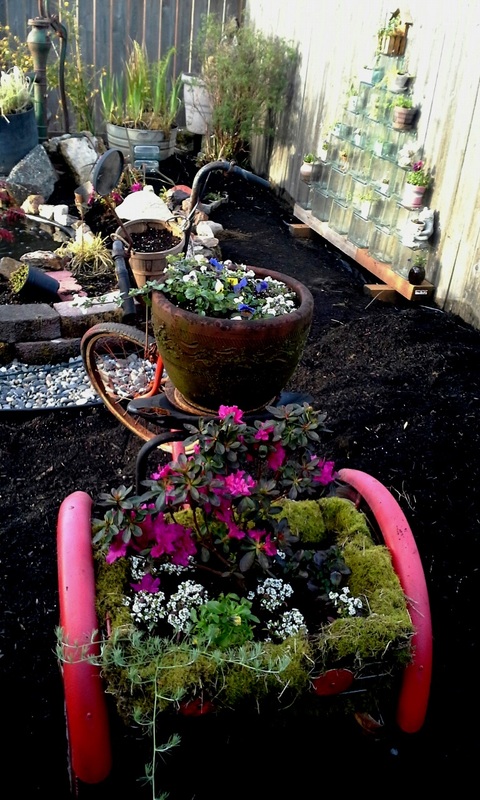 I finished lining the bicycle basket with moss, then filled it with potting soil, an azalea, pansies and alyssum. I wired a basket to the front and planted seeds in it, and there is the mossy clay pot on the seat, filled with flowers. When I decide the bike’s permanent spot, I’ll plant ivy below each tire. The glass block wall climbs up along the fence. Soon the annuals will spill green leaves and multi-colored flowers over the sides and down the front of the glass blocks. This garden is growing into more than a memorial to people I have lost. It’s also a celebration of wishes fulfilled; I have hauled those blocks along with me (with a lot of help from family and friends) for three home moves over 15 years. I have collected special pots and garden trinkets all of my adult life. 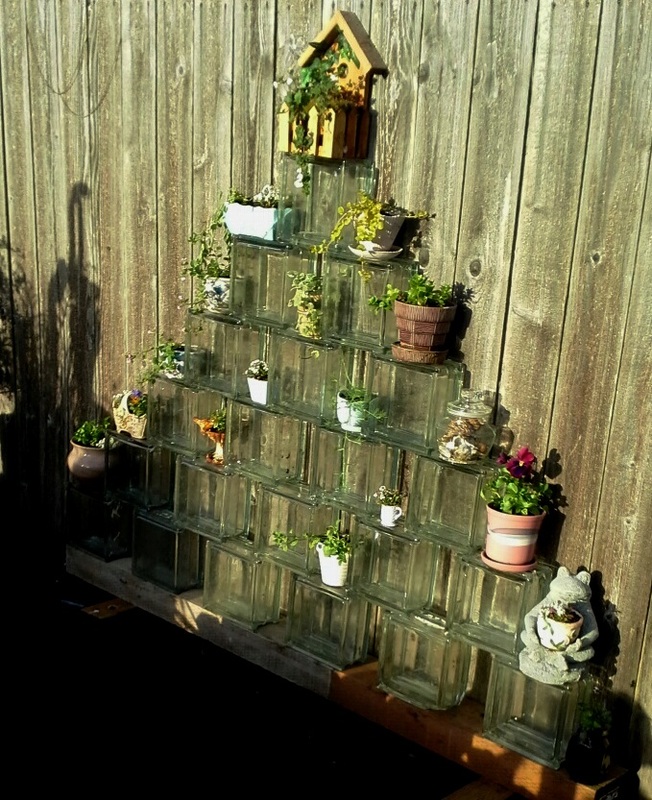 The glass wall incorporates two wishes into one: to use the blocks in a garden, and to fill all of my special pots with flowers. Many of the plants and paraphernalia came from gardens past, and friend/family gardens. This garden will be filled to overflowing with memories of people, places, hopes and dreams. If you see a plant you would like a piece of, just let me know, as they are pretty easy to mail. If you see a spot in my garden, for something you are growing in your garden, I would be happy to add more friends to the secret garden. Mom is sending me some starts from her garden, as soon as the snow melts! Categories: Challenges Prompts Contests | Tags: family, flowers, Friends, garden, memories | Permalink. Not Writing, but What The H Have I Been Doing? Oh, this and that. Crafting and reading to my little grands, taking over daughter Sara’s kitchen to make Chinese Chicken Salad, visiting gr’son in Tacoma, having a quiet week with my fishing & gardening son in Westport, building secret garden with pond, and taking a lot of photos. Will post more on phallphotos.com later this week….including a variety of bees on a variety of flowers and a tattooed seal! I’m reading a little bit and will have some reviews up soon. Grieving is an interesting journey. At times, I can hold grief in my arms and rock until it drifts off. Sometimes grief walks beside me like a shadow. Sometimes I have to carry its heavy weight on my back everywhere I go. Other times it slams me to the mat like a wrestler does his opponent. Grief has this thing about mixing things up too. I cry over anything/everything, yet I get immense joy at the smallest things. I’m exhausted, yet I can’t sleep., or I sleep for 12 hours. I want to be close to my peeps, yet I have to have my solitude; I pull you close, then push you away. I can’t think straight, misplace everything, forget everything, yet I can upload photos and (hopefully) lead a writing group. I crave food, yet I’m too unmotivated to make or eat it, and when I do, it doesn’t taste right anyway. I have a very difficult time making any decision and am allergic to commitment. I mean even tiny ones; “Mom, you want to come out to the docks while I fish?” “I’m not sure, I’ll let you know when we get there.” If I can force myself to get out of my truck, I go, if not, I sit and read or head back home. You just never know with me. And I never know with me. That’s grief for ya. Don’t fret though, I AM pulling myself off the mat and watching for a brighter day. Take it easy and thank you for hanging in there while I regroup. Rolling surf looks like ruffled lace. Jon trying out surf fishing. 1 legged gull making his point. Birds trying to steal fish from seal. New bird, need to look up. Just in time for light on boat. Jon trying out fishing on the jetty. Jon & Hunter after tickle session. 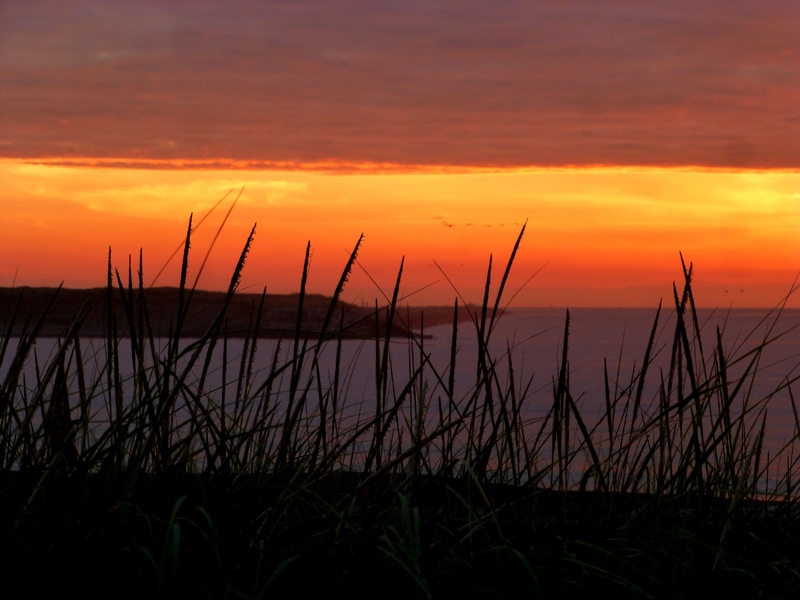 Categories: Phall Photos | Tags: beach, blog, children, family, garden, grief, photographs, photos, writer | Permalink. Writing Journal; Does Gardening Count? been living on the run, on the road, for years. but you would be at fault; wrong! What haven’t I done? You would ask! I haven’t worked on the memoir, or the postcards book. I haven’t posted my new features for writers and caregivers. I’ve written the first couple of them and they sit and wait for me in the drafts folder. I just seem a little emotionally hungover from August and, well, stalled. So there you have it. Hope you stop in and say hi, maybe tell me what you’ve been up to. Tamed any lions lately? 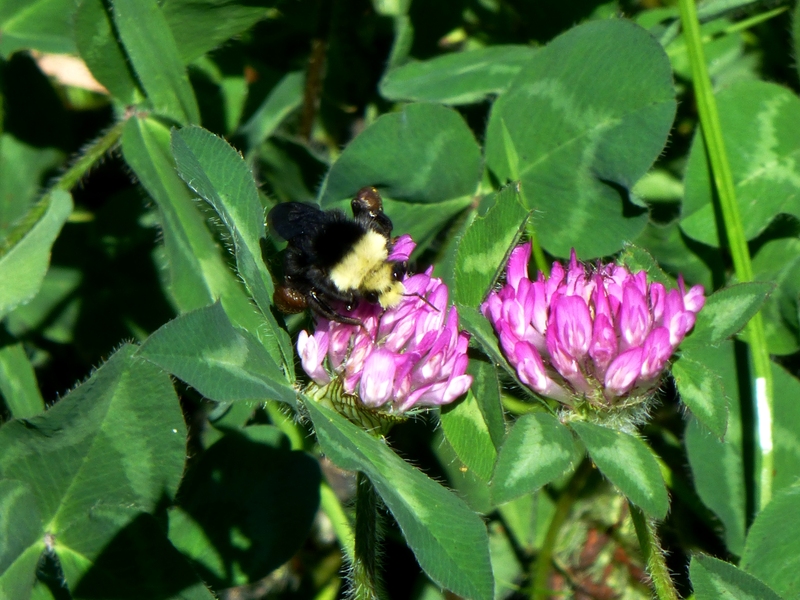 Categories: Phall Photos, Writing Journal | Tags: author, blog, book, caregiver, garden, memoir, photos, pond, writer, writer's journal, writing | Permalink. Pirate Ship Kite Sailing In The Blue Sky! Labor day weekend cruise down the beach. A lot of happy beach visitors building sand castles, flying kites, playing in the water and picnicking. We stayed long enough to look for a few agates, and it was hard not to smile at all the folks enjoying the sun and surf and each other! Sorry about the spots on these photos. My camera has issues that I need to deal with, but keep putting off. 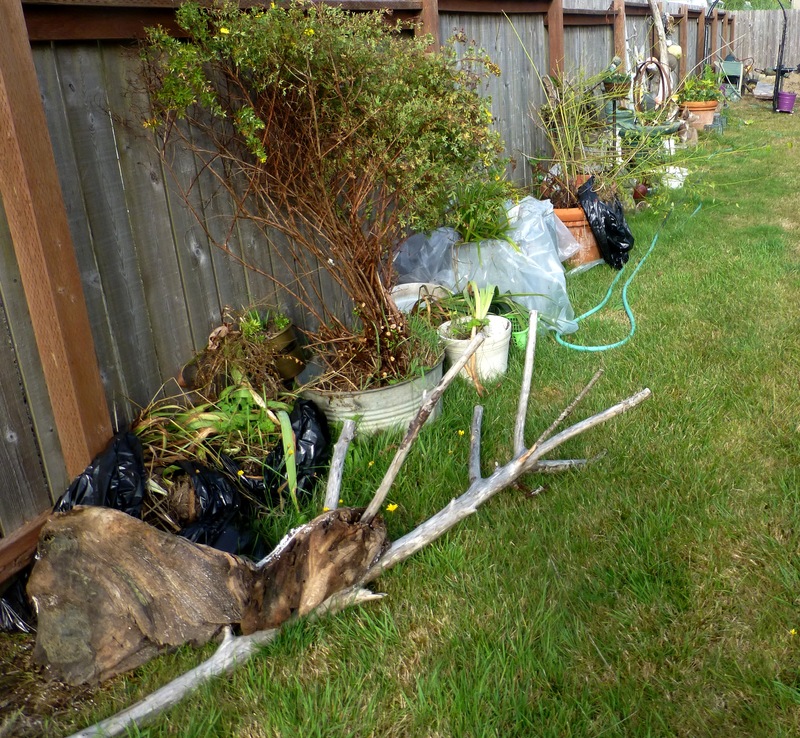 The fence is lined with garden plants and treasures, waiting to be placed in the secret garden. I wish I had the real before photo…dead truck, huge pile of bark, old boat. 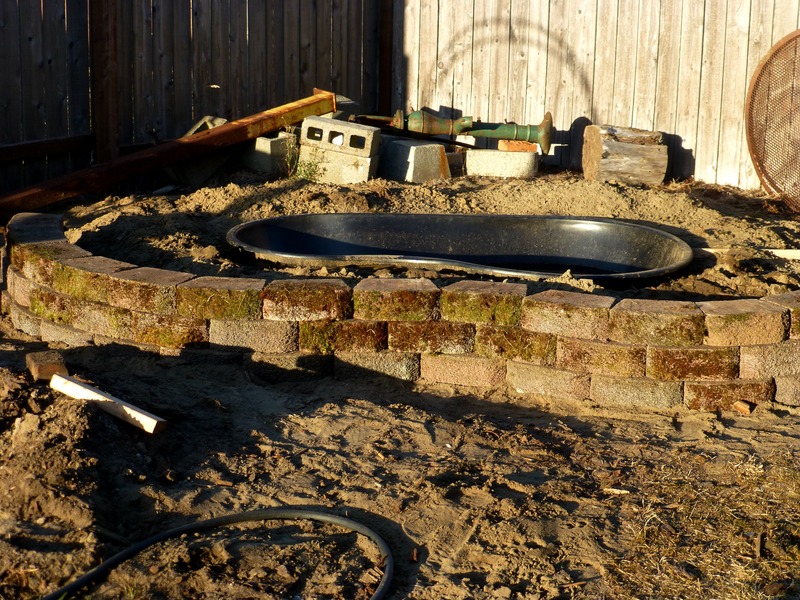 Westport is built on a sand spit, so sand is the base of this new garden. We will plant tall greenery along fences and on each side of arch, to make it more private. The arch will be moved to the right, once we get a load of soil. Those are my old metal mop buckets that I painted purple. 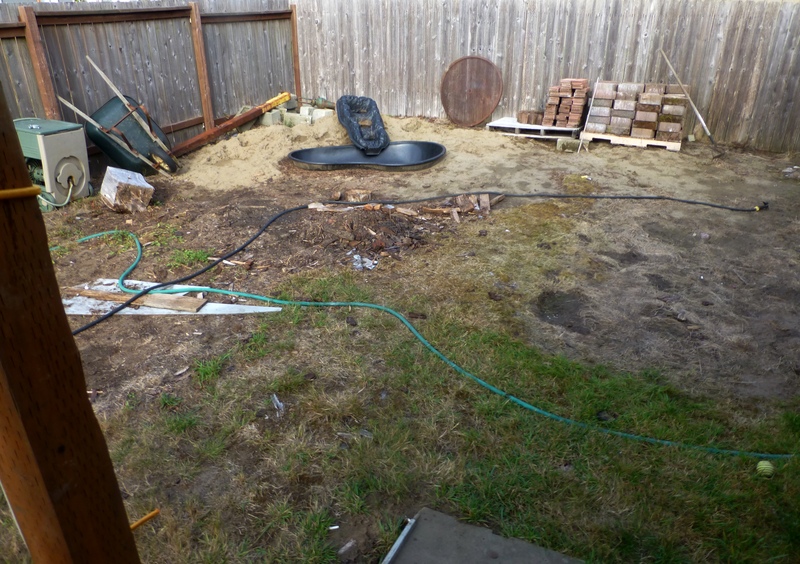 This is not my property, but I have not had a garden in over 4 years and I got tired of waiting. I still have no idea where I will land permanently, and maybe I won’t. Maybe I will be a beach gypsy who wanders forever. But, damn, I needed a garden, needed to see my pond and plants and garden treasures. This is taken from the end of my porch…so just imagine when it is filled with plants and flowers and the pond fountain is going…ahhh. When I say goodbye to this little secret garden, it won’t be because of a life crisis, (like my last 2 gardens) it will be because I’m off traveling and exploring, or maybe I find a permanent landing spot. For now, I will love love love stepping off my porch into this little piece of heaven. The little wall goes up. Pouring form for 4′ waterfall in next few days. And not a drop of this has anything to do with writing. I had to take a detour before delving back into the memoir series. Thanks for stopping by, it is always nice to hear from you! Categories: Phall Photos | Tags: butterfly, garden, kites, pirate, pond, secret garden | Permalink. Mom, Rae Hall, has her photo page on my photo blog here. Updated pages don’t get published, like main page posts…gggrrr. 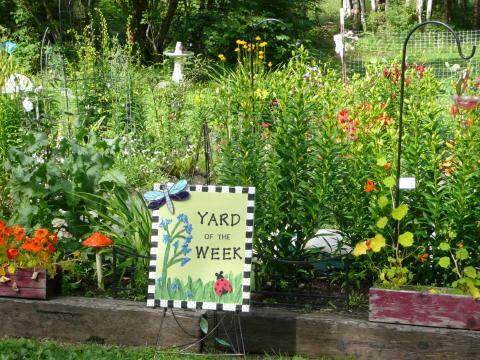 The local newspaper often chooses mom’s garden as Yard of the Week during the summer months. This is the sign they place there. Categories: Phall Photos | Tags: flowers, garden, photos | Permalink.